Honey bees of different age and castes were investigated calorimetrically at 20, 25 and 30 °C. Experiments were completed by endoscopic observation of the insects in the visible and the near infrared range and by acoustical monitoring and subsequent frequency analysis of various locomotor activities. 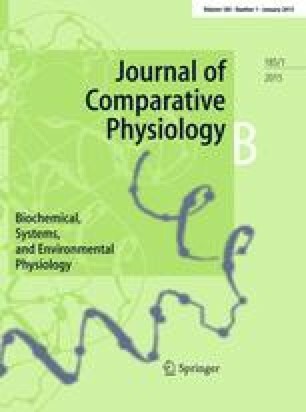 Direct calorimetric results of this paper are compared with data of indirect calorimetry from the literature using a respiratory quotient of 1.00 and 21.13 J consumed. Agreements between both methods are generally good. The results show that weight-specific heat production rates increase with age of worker bees by a factor of 5.6 at 30 °C, 3.7 at 25 °C and 40.0 at 20 °C. In groups of foragers the heat production decreases with growing group size to around 6% of the value for an isolated bee. The presence of a fertile queen or of brood reduces the heat output of a small worker group significantly. Adult drones exhibit a much higher metabolic rate (up to 19.7-fold at 20 °C) than juveniles with strong fluctuations in the power-time curves. Fertile queens show a less pronounced heat production rate than virgin queens (54% at 30 °C, 87% at 25 °C and 77% at 20 °C). Calorimetric unrest is much higher for young than for adult queens. Heat production is very low in both uncapped and capped brood and less than 30% of that of a newly emerged worker. In most cases temperature showed a significant influence on the metabolic level, although its sign was not homogeneous between the castes or even within them. Locomotor activities are easily recorded by the acoustic frequency spectrum (0–7.5 kHz) and in good agreement with endoscopic observations and calorimetric traces. This paper is part of the PhD thesis of L.F.